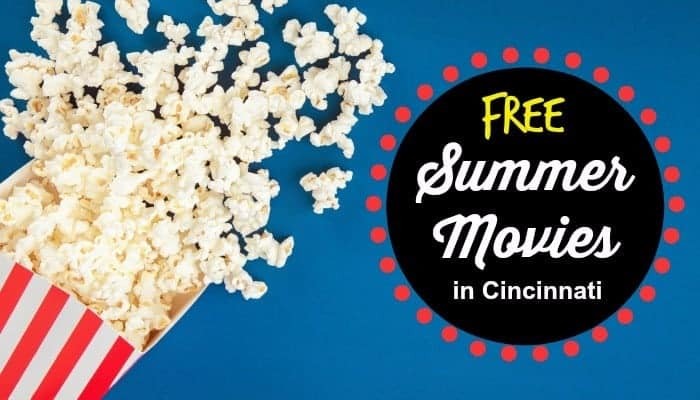 If you’re looking for some free summer fun, take a look at this list of Free Summer Movies in Cincinnati. There are lots of movies in the park to choose from and our locally owned and operated Kenwood, Mariemont, and Esquire Theatres offer some kid free kid flicks too. The Kenwood, Mariemont, Eastgate, and Esquire Theatres offer free kids’ movies on Monday and Wednesday mornings starting on June 4, 2018. Each week features one movie (repeated on Monday and Wednesday). Features include Muppets From Space, Jumanji, Stuart Little, Smurfs 2, Pirates! Band of Misfits, Muppets Take Manhattan, Surf’s Up, and Cloudy With a Chance of Meatballs. Washington Park is hosting Summer Cinema – a series of Wednesday night movies in the park. Titles include: Mulan, The Land Before Time, National Lampoons Vacation, Pride Week Movie- TBA, Love and Basketball, Independence Day, The Lion King, A League of Their Own, Jumanji, The Big Short, Star Wars the Last Jedi, Black Panther, Grease, Dead Poets Society. Deerfield Township offers “Movies in the Park” on select Fridays during the summer. Movies include Wonder, LEGO Ninjago, Cars 3, Smurfs The Lost Village, Coco, Jumanji, and Wrinkle in Time. Anderson Township Park District hosts “Movies in the Park” at Beech Acres on June 1 (“Despicable Me 3”) and August 24 (“Wonder”), starts at dusk. Spring Grove Cemetery and Arboretum offers some free outdoor movies – It’s a Date Night Movie Night on July 13 (title TBD – Spring Grove Cemetery) and a second outdoor movie on August 2 (title TBD – Oak Hill Cemetery). Summer classic movies will be featured as part of “Cinema in the City” at Seasongood Pavilion; live music too! June 8 – “The Sandlot” with music by Comet Bluegrass Allstars; July 13 – “Elf” with music by Sound Body Jazz Orchestra; August 10 – “Labyrinth” with music by Jake Speed and the Freddies. Liberty Center offers Movies Under Moonlight on Tuesdays starting at dusk (June 5 – August 28, 2018). Their selections are NUMEROUS so be sure to check out that list on their site. Xscape Theatres in Northgate offers free kids’ movies on Tuesday, Wednesday, and Thursday mornings. Movies start at 9:30am. Many of the movies are weather dependent. All events were accurate at the time of this posting but things do happen and events do occasionally get canceled or postponed. You should always double check with the event source before you head out the door. Links for each event are provided so that you can be sure the date is still accurate before you head out. Gorman Heritage Farm Sunflower Festival – 1st weekend in Oct. This year Oct 6 & 7. SUNFLOWERS!!! Music, booths & crafts. Shaw Farm in Milford during month of October- hayride, pumpkins, music, corn maze.